The quote above comes from WLWT Chief Meteorologist Kevin Robinson and is referring to a winter storm that is coming this weekend. That’s right, the snow from last weekend is still on the ground and it’s time to start prepping for “something” to fall from the sky. And, if that wasn’t bad enough, the forecast for West Chester calls for highs in the mid-teens with Sunday showing a low of -3 degrees! 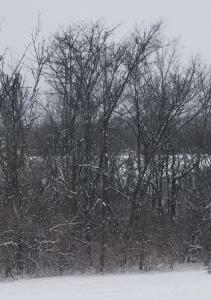 While the kids seem to be enjoying the snow, it’s no fun for those of us that need to clear driveways and sidewalks. It’s also potentially problematic for homeowners. The heavy snow and changing weather create the possibility of ice dams and water damage. Another risk is the dropping temps which raise the risk of freezing pipes. The American National Red Cross has some great tips on how to protect pipes from freezing so be sure to check those out. Another point to keep in mind is that no matter whether the weather brings, snow or rain, this weekend at some point what’s on the ground is going to eventually all turn to water. We will be looking at water-logged soil and lots of surface runoff, which can lead to flooded basements. If you have a sump pump, now is a good time to perform a bit of sump pump maintenance to make sure yours is in good working order. Also, don’t forget to check the status of your battery backup. However, even with the best planning, water damage emergencies can still happen, so it’s good to be prepared. Aside from obvious sitting water in your basement, be on the lookout for damp spots on your carpet, new stains on the ceiling, peeling paint, or a musty smell in any room. If you see any of the above, it’s time to act. 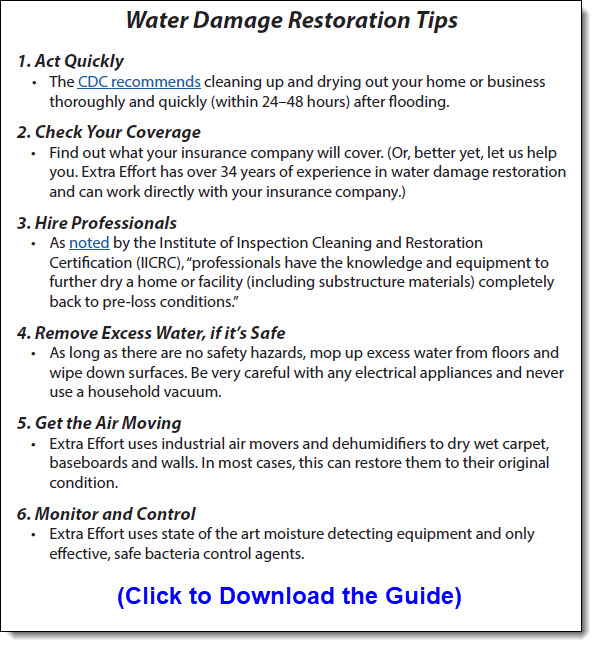 The printer-friendly guide below covers the key steps for the water damage restoration process. As always, we hope you won’t need us, but if you do, please call me at the number below.